The space of the video installation is a narrow corridor 12 m long, 2 m wide and 3 m high. A side wall serves as the screen for a back projection. The surface onto which the image is projected is 3 X 12 m in size. There are in fact three video images screened from three video projectors so that the edges of frames touch, and they appear to fuse into a single elongated image stretching across the entire wall. This could almost be described as a traditional triptych. The image shows portraits of men and women who, calm and motionless, observe the viewers in the narrow corridor. Their faces are dimly lit and the corridor is therefore a dark and somewhat scary place. The faces of unknown people in the portraits are over two meters high and the viewer must, in the circumstances, observe from from close up. 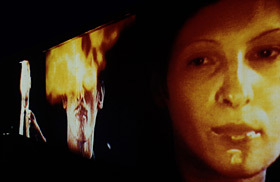 Suddenly, one of the faces from the screen-wall spits out a large ball of fire which illuminates the corridor with its glow. The accompanying sound, in slow motion as the image, resembles thunder or an explosion. Then another face from the screen spits out a ball of fire. A period of silence follows. Is the ball of fire propelled from their mouths the unspoken word which replaces all words? In an unpredictable sequence, explosions interrupt the time of peace. Perhaps the time of explosions is interrupted by moments of peace. After all, the arrival of images of night shelling of Sarajevo to our TV screens is the result of hundreds of thousands of minuscule explosions of light that take place on the interior surface of the cathode-ray tube.